In 1853, Hippolyte Flandrin, a pupil of Ingres's who specialised in religious painting, received an official commission to paint a standing portrait of Napoleon III, although this commission was soon cancelled. The work was to be finished in 1861 and the commission retrospectively regularised by the State in 1862, with 20,000 francs being given to the artist when the picture was already hanging at the Universal Exhibition in London. This is an penetrating psychological study of the emperor. Indeed, almost despite the fact that it was an official commission, the work is profound and reveals the complexity of the man's character. The emperor is wearing a military uniform and stands staring at the viewer, whilst over his shoulder looms a marble bust of Napoleon I. On his desk lie maps of France and a volume of Caesar's Gallic Wars. The clouded expression, much noted by contemporaries, has an exceptional intensity. “This is without doubt the first «real» portrait which we have of Your Majesty” declared Théophile Gautier. And this ‘reality' was not only disliked by Napoleon himself but even more so by his entourage. Princesse Mathilde remarked damningly: “Sire, you look like you are meditating upon the death of your son“. 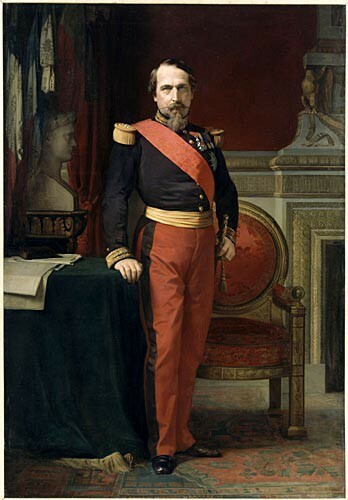 The painting was then sent to the Musée du Luxembourg and replaced in the Tuileries by a more anodyne portrait of the emperor in civilian dress by Cabanel. The emperor subsequently donated the Flandrin to the Tribunal de Commerce de la Seine in 1866, and it was finally sent to Versailles in 1884 upon the request of the national museums. The portrait had however received critical acclaim wherever it was shown, namely, at the Universal Exhibition in London in 1862, at the Paris Salon in 1863, at the Paris Ecole des Beaux-Arts in 1864 and at the Paris Exposition universelle in 1867.